Sydney Shop Girl: The Visionary Mr Eastwood. Jersey Boys. The Visionary Mr Eastwood. Jersey Boys. Mr Eastwood, you are a visionary. I am yet to catch up with your complete filmography but with each work that I have seen, a little piece of that vision finds a permanent place in my memory. Recalling scenes from your films is a visceral experience. The menacing brutality of war in 'Letters from Iwo Jima', the bitter victory of triumphing against adversity only to have the dignity of life taken away from you in 'Million Dollar Baby' and in 'Gran Torino' the complexities of life in an America that simmers with racial tension and the class divide. To watch an Eastwood film is to see a very specific vision of an aspect of American life - to triumph over seemingly insurmountable odds and then to often succumb to them again but to finally come through life's battles with the strength and wisdom to keep on fighting. Not necessarily richer nor more powerful nor even a 'better person'. The journeys are often bleak but oh, the moments of beauty and humour. They play a powerful role in the narrative because they occur so unexpectedly. All of which is basically preamble to the fact that I saw the Clint Eastwood directed 'Jersey Boys' today. The film is an adaptation of the Tony Award winning Broadway musical of the same name and it is brilliant in every way. The story of Frankie Valli and the Four Seasons is told partly to the camera by each of the band members and through the more conventional, omniscient eye of the cinematographer and director. Visually, things are kept interesting with scenes that look as if they've come straight from a Broadway production interspersed with 'real world' visuals. How could you not love the look and sound of the film? The America of the 1950s and 1960s was just made for cinema. The contrast of the theatre of live television performances on American Bandstand, the chic of supper clubs, the all American wholesomeness of diners and middle class neighbourhoods and the emerging 'loosening of morals' as exhibited by Mod fashion. All of it is so lovingly recreated in 'Jersey Boys'. In the hands of Clint Eastwood, 'Jersey Boys' is not 'just' a musical. It is the story of Jersey handshakes and the real promises they make. The implications of keeping these promises no matter what the personal cost and the bitter truth about how the glitter and gold of fame comes at a huge price. But the thing that made it all worthwhile for Frankie Valli? Why, the music, of course. The music that the Four Seasons made from the first moment they harmonised. It always was and always will be about the music. As an audience today we hummed and sang along, we laughed, we tapped our feet and we almost broke out in applause with some of the songs. 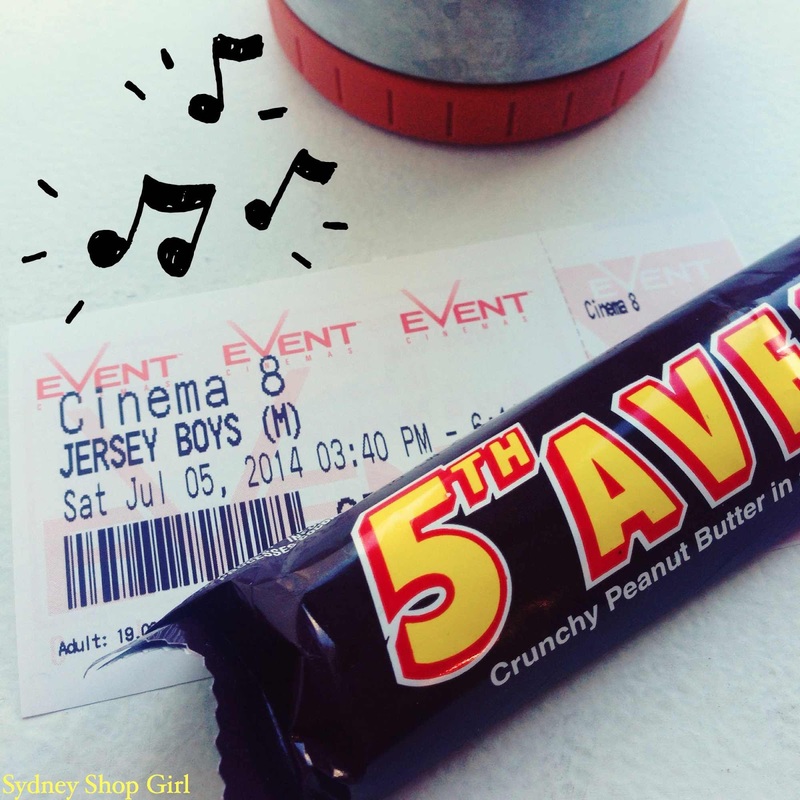 'Jersey Boys' is one of those films you experience with all your senses and whose music will be on your playlist for days and weeks afterward with a new poignance as you recall the scenes and context in which the songs were sung in the film. A thermos of Yorkshire Tea and a 5th Avenue chocolate bar were my movie snacks today. I'm old. And particular. In honour of it being the first time I've been to a cinema in a very, very long time (movie tickets cost $20 and you get assigned seats these days?!?! ), I took along one of my precious 5th Avenue chocolate bars from Aldi. They are an uptown version of Butterfingers and I am so glad to have a whole lunch box filled with them in the SSG Manor pantry. you need a book and film review column in a paper, you know that? Aww, thanks, C! High praise, indeed. I'm so looking forward to this! I think I will be taking my Mum as it isn't really the other half's style. Luckily for me, our local cinema still only costs $11 and is free seating. Your mum and yourself will love it, Lisa! I've been playing the soundtrack 24/7 here. Might have to see this one, but I am boycotting any cinema charging $20 a ticket unless it's Gold Class. Books I've Been Thinking About Lately. A Sunset In Words. Save the Date. Returning to the Routine. Makeup Misses. Lemon Juice and Lemonade Cake. Good To Be Home. The Second Winter. Preppy Friday. Watching Sydney Wake Up. Crofton Cast Iron - Cheap, Chic and Rather Good.